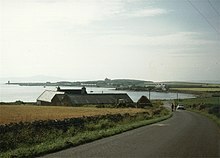 'S e eilean ann an Arcaibh a tha ann an Siapansaigh (Beurla: Shapinsay; Lochlannais/Nornais: Hjálpandisey). Ann an 2011 bha 307 duine a' fuireach anns an eilean. Air a tharraing à "https://gd.wikipedia.org/w/index.php?title=Siapansaigh&oldid=502953"
Chaidh an duilleag seo a dheasachadh 14 dhen Lùnastal 2015 aig 06:45 turas mu dheireadh.